Let�s face it, we almost all do it. Someone says �salad,� and you automatically think of a bowl full of leafy greens, usually with some veggies tossed on top. For some of us, that kind of salad sounds really appealing, others think it should be left for the rabbits, and many people fall somewhere in between. If you�re one of the people who think of green salads as rabbit food, or even if you�re just in the mood for something different, remember that the term �salad� can encompass many other things than just a bowl full of lettuce. And just because you may opt for a different kind of salad, it doesn�t mean that you have to leave healthy eating behind. 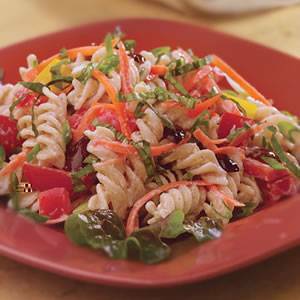 If you�re in the mood for a pasta salad, the best way to begin is with whole grain noodles. The whole grain will stay with you longer, so you won�t be looking for a snack an hour later. Once your noodles are cooked, try tossing them with some fat free ranch dressing instead of regular mayonnaise, so you get flavor instead of fat. At this point, add any vegetable you have that sounds good. Dice tomatoes, zucchini, broccoli, mushrooms, or whatever else you have, and feel free to experiment on whether you like your veggies cooked or raw. Finally, you can add just a small amount of diced chicken breast, skim cheese, or even a scoop of cottage cheese. If chicken salad strikes your fancy, there are ways to lighten it up as well, instead of just loading on the full-fat dressing. First, be sure to think outside the box when it comes to ingredients. 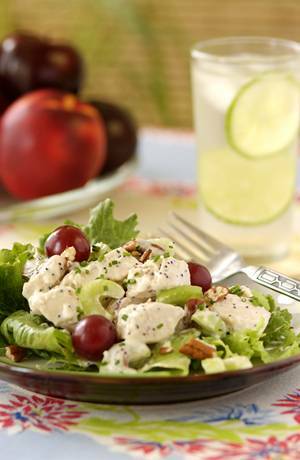 All sorts of fruits really stand out when tossed into a chicken salad, so dice up some grapes, apples, strawberries, dried cranberries, apricots, etc. and throw them in! With the flavors of the fruit, I don�t normally like ranch dressing, so I stick with mayonnaise, but try a low fat or fat free variety, and use a bit less than you normally would. Then, to kick the flavor up a notch, you can add a dash (or two or three) of lemon juice for added zest! If you want to add some crunch, celery can be a great way to go, or add some walnuts or pistachios. 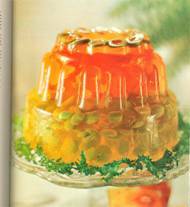 Finally, we can�t forget jello salad. While it may seem like there are limited ways to make jello healthy, starting with sugar-free jello is a good way to begin. Next, add all the fruits that you like. Try strawberries, apples, mandarin oranges, canned pineapple, bananas, grapes, or others. If you want to add a bit of sparkle, stir in the boiling water as usual, then put it in the fridge for 5 minutes. After 5 minutes, take it out and add your favorite fruit-flavored diet soda in place of the cold water, then place back in the fridge for as long as directed on the package. One more way to add a bit of a healthy flare to jello salad is to make the jello with yogurt in place of the cold water for an opaque appearance and a creamy, smooth taste. No matter what kind of salad sounds appealing, it is nice to know that there are ways to fit them into your diet without breaking every last New Year�s resolution. Here�s hoping you�ve found an idea or two you�d like to try!